Happy Spring! Speaking of Spring, I wanted to tell y'all about Spring Showcase one last time. It's only a week away, (April 6th) and I am so excited about what it's for. Every, year we send a bunch of students to Bellingham, Washington to be trained in the art of campus ministry. The conference is called SICM (Student Institute of Campus Ministry), and SICM just celebrated 26th year of training people. When I was a student at UNT, I was invited to SICM in 2013 with people who I would eventually work with on our staff, and with people who would become my best friends. All of these people are still on mission today. It was there that I caught a vision of what practical and biblical mission could look like on a college campus, in the workplace, and how to invite people into being transformed by Jesus. SICM is a unique gift that keeps on giving. I just wanted to start off by saying how thankful I am for all of you. Y'all have been so wonderful at responding to prayer requests for our students, and I can honestly say I'm seeing some real heart change from the Holy Spirit in our students lives. Thank you for being faithful in your support of campus ministry, and more than anything your prayer is the most vital part of it. Hey, everyone! I hope your Christmas was a wonderful time celebrating the birth of Jesus with friends and family! As sad as I am about the Christmas season ending, I am excited for the new semester which starts very soon. I think the Lord is going to do something big this semester, but before I get into that, I would like for you to read about Timothy, a student from our UT Dallas campus. Have a peek! I hope this fall season has made everyone feel warm, cozy, and closer to loved ones. As always, thank you so much for how you support the mission of college ministry. Every week, I am humbled a little more in awe and wonder at what an important mission it is to reach college students. This is the time they are most open and willing to learn more about Jesus and we are lucky to get to do that in the freedoms this country offers and in the context of a healthy community. So, thank you! As always, we have our student update! Though he is no longer a student, this is exciting because I actually went to school with him. 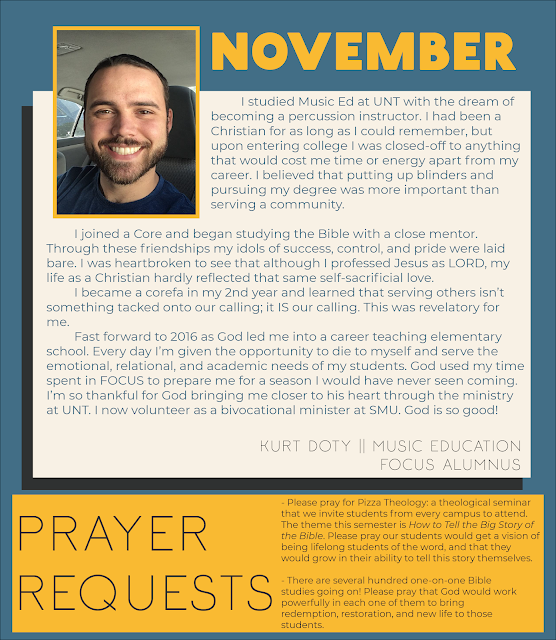 His name is Kurt Doty and he has been a part of our student ministry, church family ministry, and has been helping out with our SMU plant since it began in 2017. Please take a moment to read his story.